Want a taste of what’s in store for you in 2019? Download a list of the 2018 orchestra repertoire and a description of the small ensemble choices. Discover the breadth of music AMGuSS will explore! There are tuition scholarships available if you are 30 or under! Apply by March 1, 2019. Matt Flinner will be our guest artist for 2019! 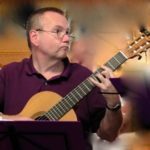 AMGuSS (The American Mandolin & Guitar Summer School) was founded in 1986 to promote the art of ensemble playing for the guitar and mandolin family instruments. Each session combines classical study with an exploration of folk and world music, in workshops, small chamber ensembles and an all-school plucked-string orchestra. From Baroque ornamentation to Brazilian choro, AMGuSS is dedicated to broadening the musical horizons of its students. 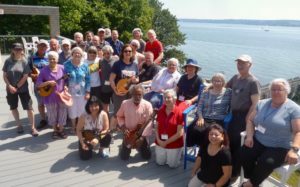 One of the first American summer schools for mandolin & guitar, AMGuSS ran annually the last week in June every summer from 1986 until 2009, when it paused for a few years. It came roaring back in 2017, in response to student requests, and that success reestablished its annual status. With small classes, accomplished faculty, and an emphasis on fun, AMGuSS continues on! Click to download our 2019 Registration Form. to develop your musicianship and interpretation skills through rehearsals, sectionals, and a concert performance. Music for 2018 included works by J. S. Bach, Benjamin Britten, Peter Maxwell Davies, Ernesto Nazareth– and more! in groups of 4-7 students, created and coached daily by our faculty. Ensemble choices for 2018 included: Classical Mandolin Ensemble, Baroque Beyond Bach, The Rio Roda, and Head Chart Ensemble. Or you can bring your own ensemble for our coaching. through informative workshops, inspiring concerts, and informal jam sessions. Tuition for the week is $450. On-campus room & board options are available. Single and double dormitory rooms are available in small suites, with two rooms sharing a bathroom and living area. Meals are served cafeteria-style in the nationally recognized campus dining facility, with food options for vegetarian, gluten-free and other diets. Meals run from dinner on the 25th through lunch on the 30th. on mandolin-family instruments & guitar. Marilynn Mair has shown the world what the mandolin can achieve in the hands of a skillful artist. Internationally praised for her concerts and recordings, she has established classical mandolin in chamber music circles worldwide, earning the title, “First Lady of the Mandolin”. Marilynn has performed at prestigious venues such as Carnegie Hall, the White House, and Lincoln Center, and internationally in Europe, Japan, China, and Brazil. She has released two dozen highly acclaimed solo and ensemble CDs, and appeared on numerous compilations. 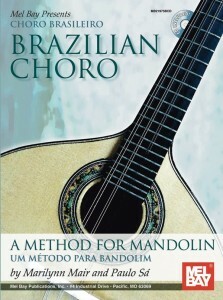 Marilynn published her 224-page method book, The Complete Mandolinist, in 2008, and her bilingual choro method book for bandolim, Brazilian Choro – A Method for Mandolin written with Rio-based bandolimist and professor Paulo Sá, in 2010. 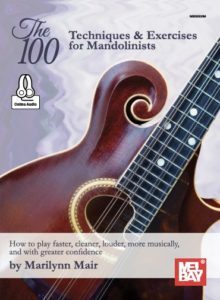 Her third book, The 100 – Techniques and Exercises for Mandolinists, published in June 2017, chronicles Marilynn’s journey on mandolin with a series of original exercises and ideas to improve practice technique and performance. 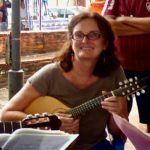 In order to devote more time to performance and composition, Marilynn recently retired as a Professor of Music at Roger Williams University in Bristol, Rhode Island, where she taught courses in music and cultural history specializing in the Americas. She spends time each year in Rio de Janeiro, where she researches and performs Choro music in rodas throughout the city. As well as founding and directing AMGuSS, Marilynn also founded and directs Enigmatica– a plucked-string chamber ensemble now in its 18th year. Fran’s head has been in business and her heart has been in music (and sports) for a long time. 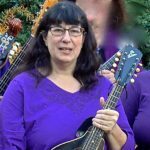 At 15 years old, she became a life-long mandolin lover taking lessons with Jethro Burns (of Homer & Jethro), where they played tunes and talked about the Cubs. After co-founding and running an Internet company, Domania Inc., she was Associate VP for Road Scholar North America Programs. Recently, she’s run a consulting firm to work with non-profit and small companies, and (most recently) the Boston Red Sox. During this time, she’s also been a continuing education student at the New England Conservatory to learn what it means to be a musician, and sat in on bluegrass jams to figure out how to do it fast! Fran is a founding member of Enigmatica. Catherine is Associate Professor of Music at Roger Williams University, where she established and directs the Instrumental Ensemble. Her interest in Medieval music led her to Indiana University’s Early Music Institute, where she earned a Doctorate in Music, as well as pursuing studio work in fine arts textiles. She was a producer for IU’s Focus record label and wrote several seasons of the Public Radio program Harmonia. 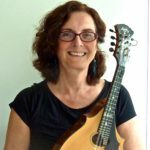 Catherine was a founder of the early music quartet Melusine and the Smiling Dog Band and has performed extensively in genres ranging from opera to circus to jam band. She and her compositions have appeared on numerous recordings, most recently, Enigmatica 3. Catherine plays mandola and recorder, and occasionally banjo, with Enigmatica. Bob began playing the guitar at the age of seven and turned his attention to the classical guitar some twenty years later. He has performed in concert with mandolin orchestras and chamber ensembles in the U.S., Canada and Europe. His compositions have been recorded and performed in North and South America, Europe and Australia; the most recent additions being performances in Slovenia and Croatia. In June 2017, he retired from a thirty-seven-year career as a public school music teacher. Grateful to have survived relatively intact, he’s now looking forward to daily practice and composition sessions, books, herb gardening, cooking, genealogy, hockey games, meditation, volunteer work, and the occasional martini. Bob is a longtime member of Enigmatica. Ralph has been part of the AMGuSS faculty nearly since it began. Originally attending as a student in year 2, his enthusiasm and instructional expertise– honed from years of teaching public-school music– along with his charismatic leadership in after-hour jam sessions quickly earned him a promotion to faculty in charge of beginners. 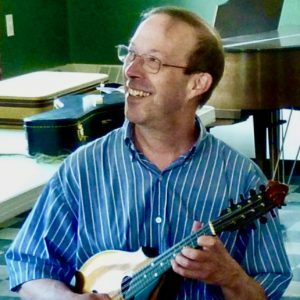 Known for his ability to engage players in developing technique and musicianship skills, whether in the 2nd-mandolin section of the orchestra or in newbie chamber music coaching sessions, Ralph takes beginners under his wing to ensure that they experience AMGuSS to the fullest. And he remains the heart and soul of the AMGuSS informal night-time jam sessions, where his broad musical knowledge has lead to many a memorable experience. 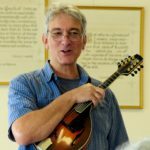 Charlie joined the AMGuSS faculty in 2018, transitioning from student-who-knew-too-much to faculty and coach, introducing early-morning “mandolin yoga” sessions for those wanting to ad even more playing time to their day. He performs with Enigmatica, and as a soloist and band member in a variety of ensembles. Charlie started playing the mandolin one particular day in 1975, and has rarely missed a day since. He is sometimes distracted by the classical guitar, the electric bass, or his Fender Telecaster, and occasionally by his career as Charles V. Moser, Musician-at-Law. (BA in Applied Music from Keene State College, JD from UNH School of Law). He is veteran of many commercially unsuccessful but artistically outstanding musical groups, covering styles from classical to cowboy to rock ’n’ roll. Early influences include Beethoven, The Tijuana Brass, and the My Fair Lady soundtrack. 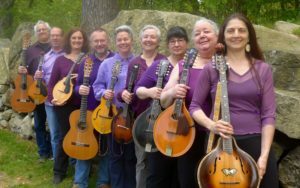 Enigmatica is a New England-based mandolin ensemble directed by Marilynn Mair. Part chamber orchestra and part plucked-string double-quartet, Enigmatica performs a variety of music: Baroque, Brazilian, eclectic contemporary, and Americana music written by group members and friends. The ensemble features instruments of the mandolin family — mandolin, mandola, octave mandola, and mandocello — and 6- and 7-string guitars. Ensemble members come from Massachusetts, Rhode Island, and New Hampshire. Their repertoire includes Baroque music by Bach, Vivaldi, Handel, and Purcell; Brazilian music by Villa-Lobos, Jacob do Bandolim, and Pixinguinha; 20th-century music by Stravinsky and Shostakovich; and recent music of composers Will Ayton, Jim Dalton, and Radim Zenkl. 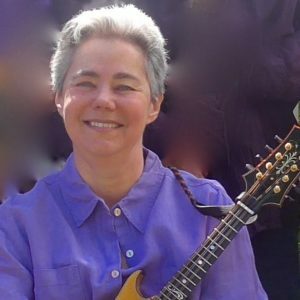 Original compositions for mandolin ensemble are rare, but Enigmatica is proud to play new works written for them by American composers Pam Marshall, John Goodin, Robert N. Martel, Catherine Hawkes, Adam Larrabee and Marilynn Mair.